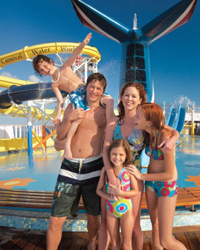 Carnival Cruise Lines are also the ideal choice for first time cruisers. There is a choice of flexible dining options and casual alternative restaurants available on Carnival ships. Dining room scheduling includes a selection of meal times including ‘Your time dining’, the flexible dining option that allows you to dine anytime from 17:45 – 21:30. The currency on board is US$. 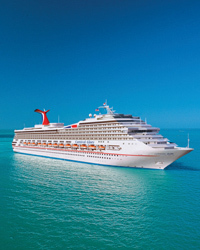 Cruises range from 2 night short breaks to 18 night sailings. Gratuities can be pre-paid at the time of booking, alternatively they will be automatically added to your on board account daily for convenience.